I always thought it was sitz boneS, but Wiki says it is sitz boneZ. I will probably continue to call them sitz bones. 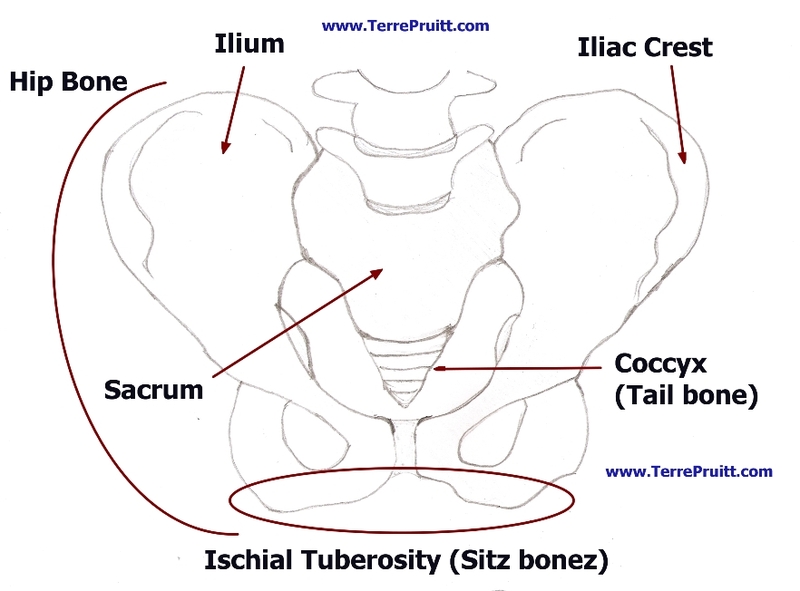 Or get really fancy and call them by the correct name: ischial tuberosity. I thought I should post a picture of them since I am often instructing students to sit on their sitz bones. I wanted to make sure that people knew where they were and what they were. It is easier to consciously sit on something or affect something when you are aware of what it is and where it is. While this (see below) is not the best rendering of the bones in the hip area I think you can get the idea. Typically the front upper part of the hip bone structure is thought of and called the hip bones. But actually the entire bone is the hip bone. The hip bones are part of the pelvic girdle. The front portion somewhat at the top, the area we often refer to as the “hip bone,” is the Iliac Crest which is on the edge of the Ilium. The bottom portion is the ischial tuberosity or sitz bonez. The sacrum and the coccyx are part of the vertebral column and not considered part of the pelvic girdle. There are names for other portions and areas of the bones, but since this post is about the sitz bones, I’m not going to list and label them all. We are all built differently so some of us will have more flesh to get through to actually feel the sitz bones. And some of us will feel them rather easily. Either way . . . . we all have them. We sit on our sitting bones or sitz bones. My drawing does not clearly show the acetabulum, the place where the head of the femur (thigh bone) fits. It is about where the words “Tail Bone/Coccyx” is. You might be able to imagine when the thigh bone is moved to a sitting position, the sitz bones protrude a bit. In yoga often times the correct way to do the pose is to have both sitz bones on the floor. In stretching having both stiz bones on the floor is sometimes the way to get the most out of the stretch. At times the way to do the yoga pose it to be sitting directly “on top” of them. Other times they might be used as reference points or points of focus. When in downward facing dog the instruction might be given to reach your sitz bones away to help lengthen the spine and take the weight off of the hands. For one stretch, one might instruct to pull your foot directly back to your sitz bones. In Nia we occasionally use the sitz bones and the floor to give our glutes a massage. Gently moving around on them, perhaps rocking and/or rolling, while sitting on the floor can be a great way to ease the muscles we just danced during the class. Sitz bones are used a lot and referred to often in yoga, stretch, and Nia, so I thought I should highlight them. Are you familiar with your sitz bones?